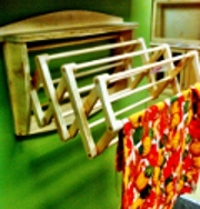 Industrial strength towel rack made from real wood that can stretch and compress and will make a lovely useful addition to your home. Beauty and brawn. This is no ordinary towel rack. This is YOUR towel rack!